Meaning “day of celebration” in Japanese, Kajitsu hope that the dining experience will be just that. Cooking traditional Shojin cuisine, based on strict Buddhist principles of not taking life, the wholly vegetarian menu is a treat, served in crockery sourced especially for the restaurant, some of which may be up to 200 years old. 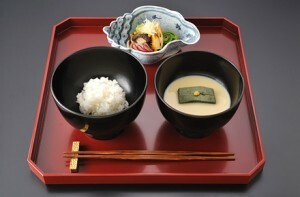 Type of cuisine: Hojin (Japanese) Buddhist. Location: 414 East 9th Street, New York, NY 10009. Opening times for dinner: Tuesday – Sunday 5.30 to 10pm. Closed Monday. Kajitsu don’t serve any lunch at the moment. 4 course “Kaze” menu £32 ($US 50). 8 course “Hana” menu £45 ($US 70). Fresh, vegetarian ingredients, prepared in flavour-enhancing ways, and carefully arranged. Chilled Ginger Tofu with Nori Seaweed Sauce, Kabocha Squash Pudding and Frozen Sake at $13 a glass! Reservations can be made on the main number, and are recommended. Service impeccable and courteous, with extensive explanations on the Japanese food served.